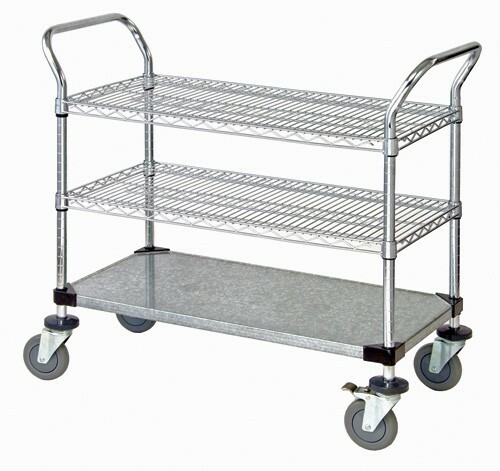 18" x 36" x 37-1/2", 2 Wire Shelves & Solid Shelf combination Utility Carts give versatility to any operation: food service, hospitals and manufacturing. 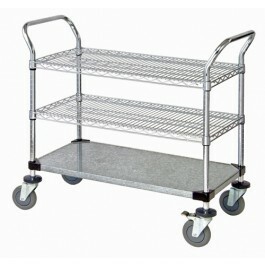 Carts consist of two u-handles, 4 donut bumpers, 4 swivel casters (2 with brakes) and Wire shelves & solid shelf combinations. 18" x 36" x 37-1/2"